Worshipping the Goddess of Knowledge, Arts and Music, Saraswati, is most popular in the "cultural capital of India" - Kolkata. The Goddess is worshipped with bel leaves, fresh white/yellow spring flowers (mainly marigolds, chrysanthemums, palash), grains of spring (specially, malt), phaag and abhro (herbal powdered colours) and white sandal wood paste. Popularly dubbed as the Bengali Valentine?s Day, Saraswati Puja , it has become an occasion when young would be couples go for a date. Floral offerings are made in a big scale. 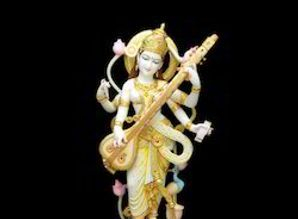 Books, articles, instruments of music and arts, earthen inkpots and bamboo quills are placed before her. The ink is made from unboiled milk water, colour powder and silver glitter called abhro. On this day nobody writes or reads any book, or play any musical instrument. This signifies that the goddess is blessing the books placed in front of her that day. On the day of Saraswati puja, young children starts writing through a ceremony called 'Hatey-Khori'. This is a ceremony which marks the beginning of writing for young children. People think that one become a learned person if one starts his introduction with letters from this auspicious day. In Hyderabad, Saraswati Puja is celebrated every year with same rigour. All the major bengali cultural associations here celebrate here to invoke the goddess of learning. Below are the glimpses through the lenses of our members year by year.